The second annual Empower(Her) Spring Salon, presented by Women United and sponsored by City National Bank, celebrated women owning their truth and unapologetically telling their stories. Leaders from across L.A. County came together to discover how they could make a difference and spur social change. 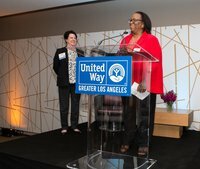 Attendees enjoyed meaningful networking opportunities and a keynote conversation between Mei-lan Stark, Senior Vice President and Chief Counsel, Intellectual Property at NBC Universal and United Way of Greater Los Angeles’ own President and CEO, Elise Buik. As Mei-lan Stark recalled her career path and life as a working mother, she shared words of wisdom to the 130 attendees that encouraged them to embrace confidence and live authentically. Another highlight of the night included the presentation of the first ever Power of Her Award to the effervescent Naomi McSwain, Executive Director of the Al Wooten Jr. Heritage Center in South Central Los Angeles. This distinction celebrates the exemplary achievements that she has made in her community, through her profession, and as a role model for other women. The night closed with CSH Speaker, Millie Brown, who shared her brave story of survival and unapologetically sharing her life path. Her poignant story recalled years of abuse and depression due to childhood trauma and five years of life on Skid Row. After applying for supportive housing and patiently waiting for an opportunity to open, she was able to finally move into an apartment of her own. Having supportive housing was truly life changing for Millie. She shared that she was finally able to come to terms with her trauma and eventually become an advocate for L.A.’s homeless population as a CSH speaker. The second annual Empower(Her) Spring Salon brought together stories and voices from all walks of life. Connections were made and guests left feeling empowered through the network of supportive women in attendance. To learn more about Women United, click here.